Wisconsin is moving forward with the Wisconsin Women Equal Prosperity Initiative . “It&apos;s impressive.” That&apos;s what Lt. Governor Barbara Lawton says about the five year progress report on Wisconsin&apos;s economic development plan for women. The state&apos;s highest-ranking female official says the entire state benefits by recognizing the role of women. Lawton says her work on the report allows us to see the progress and the extreme challenges they&apos;ve encountered along the way. Significant strides were made in our legislature to improve the status of Wisconsin women since the program began five years ago. NOTE: WW=P was launched by Lt. 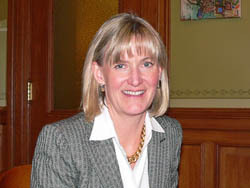 Governor Barbara Lawton in response to a Women&apos;s Policy Research Institute&apos;s 2002 report that gave Wisconsin an overall grade of C- for the status of women.